Armando Curcio Editore. 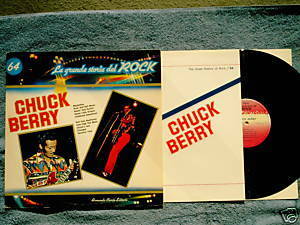 Chuck Berry La grande storia del rock LP includes Maybelline, Reelin' and Rockin', Sweet Little 16, Roll Over Beethoven. Italian series. Liner notes in Italian by Enzo Caffarelli. Insert with English translation. Vinyl is VG/VG; gatefold cover with photos is VG with some corner wear; English insert is included.